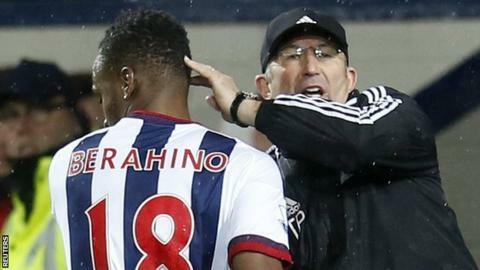 West Brom striker Saido Berahino says he regrets threatening to go on strike and has apologised to the club and its supporters. The 22-year-old tried to force a move away from The Hawthorns in the summer after the Baggies rejected two bids from Tottenham Hotspur. In September he tweeted he would never play for chairman Jeremy Peace. But he said: "It is something I look back on and really regret. I should never have said that. I am human." Berahino, who was the subject of a £21m bid from Newcastle in January, has scored six goals in 25 games for Albion this season, with boss Tony Pulis critical of his form and fitness. The England Under-21 international netted 20 times for the Baggies last term. "I make mistakes," he added. "I hold my hands up and I say it was a mistake from me. I just apologise to all the fans out there that have always supported me and also the club that has always believed in me. "I have missed a lot of football and I am just trying to get myself back into match fitness and sharper again like I was last season. "My focus is mainly on getting back to what I was last season and finishing really on a high." West Brom are 14th in the Premier League and entertain Crystal Palace on Saturday.